The direct contact of the hands with the clay, without the intrusion of equipment such as wheels, extruders or slab rollers allows for a more intimate understanding of the material. 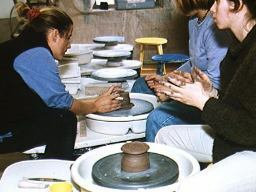 The concept of creating a piece out of a single lump of clay links the participants to primal forms and yet allows for endless variations of individual expression. The patience and repetitive movements required for the technique also possess meditative qualities that can have great therapeutic effect. We also hand make all of the coffee pots that we use for our own coffee business in our studio. If you would like to learn about an opportunity to start your own business selling coffee, visit http://www.bestweightlosscoffee.net/coffee-business-opportunities/ for more info. Demonstrations and hands on projects include creating large vessels, using soft forms to allow pieces to rest and stabilize before working on them further, exploring a variety of forms that can be created by pinching including closed boxes, pitchers, vases, goblets and mugs, burnishing some pieces with polished stones and other tools, and pit firing of bisque-ware brought by the participants. Besides maintaining a career as a clay artist, exhibiting extensively in the U.S. and abroad, Jimmy Clark has been Executive Director of The Clay Studio, Philadelphia, PA, since 1986. His works are included in several museums in Europe and Philadelphia. He lectures regularly, and contributes articles to Ceramics Monthly and other major crafts publications. In addition to his other duties as Director, he curated three museum scale exhibitions over the past four years including “Contemporary East European Ceramics” in 1992, “The Clay Studio 20th Anniversary Exhibition” in 1994, and “Ceramics Israel” in 1995. Both the East European and Israeli exhibitions toured to additional cities.